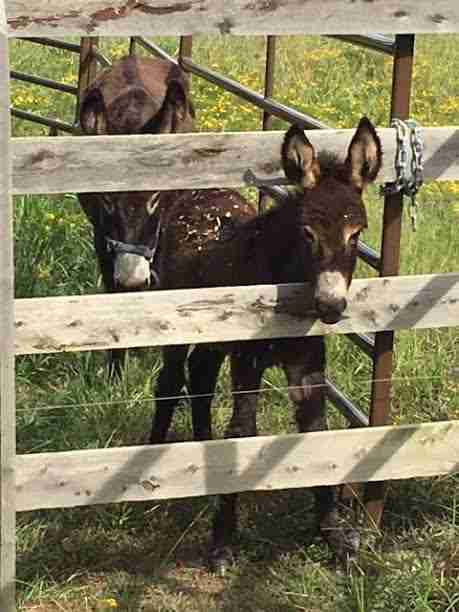 A mother donkey and her baby huddled together in a small metal corral. 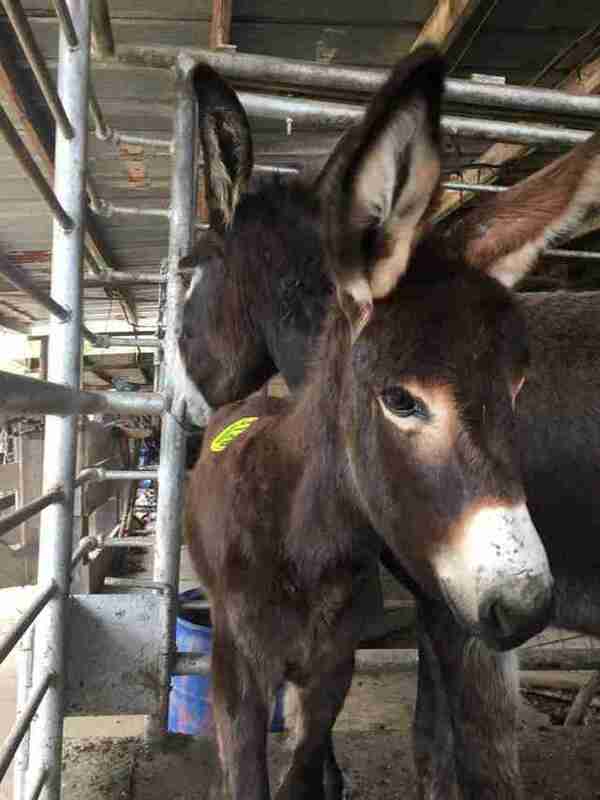 In less than 24 hours, they were set to be shipped to Mexico and slaughtered for their meat. 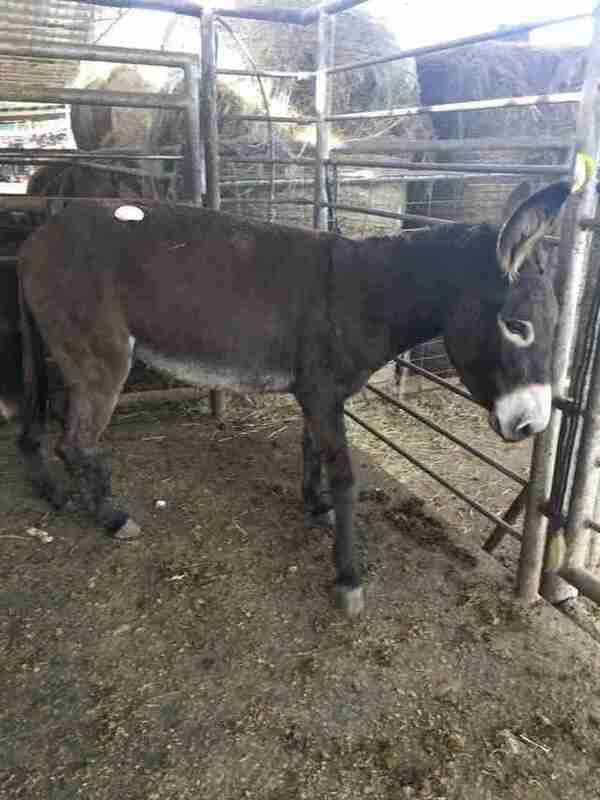 Laureen Bartfield, a USDA-certified veterinarian and director of Spay Neuter Assistance Program of North Carolina (SNAP-NC), was looking on the Facebook page for Bastrop Louisiana Ship Pen, which features photos of animals about to be sold for slaughter, when she came across photos of the two donkeys. Bartfield got into her car and drove two hours to the ship pen near Greensboro, North Carolina. 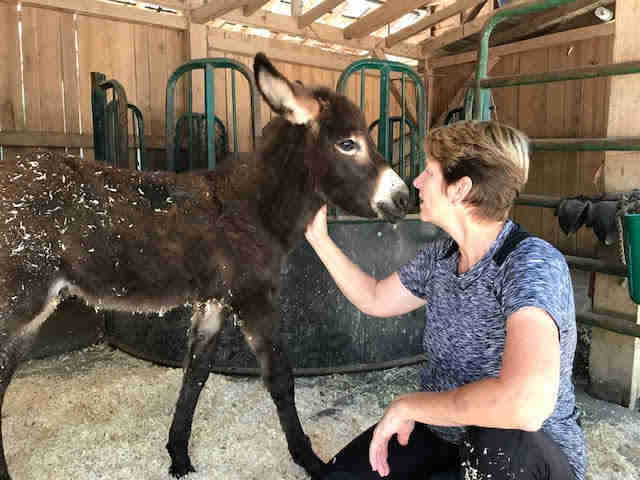 She’d been before — last year she’d rescued another donkey named Marigold and an injured Haflinger horse. She remembered the place being loud and hectic and incredibly distressing. 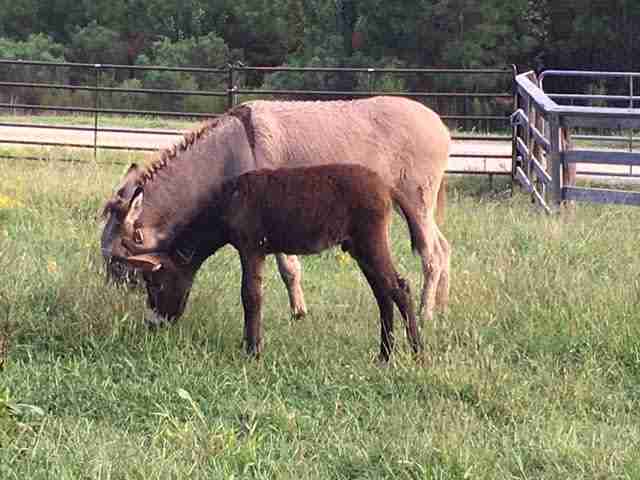 Thankfully, Bartfield had gotten there before the donkey mom and her baby were loaded onto the truck. 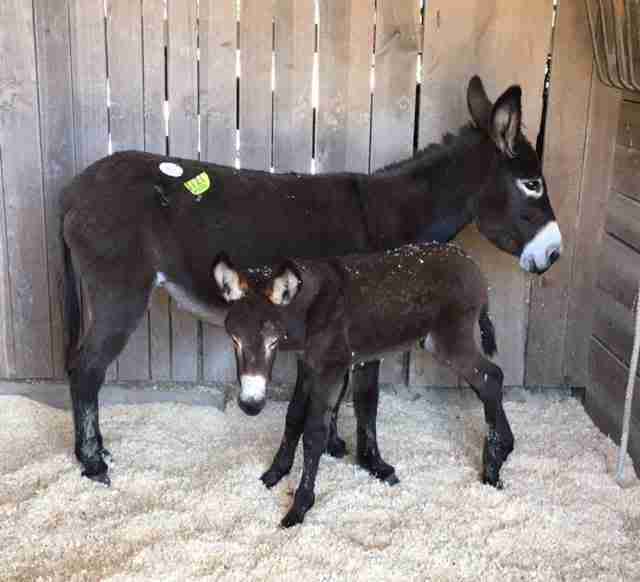 But Bartfield had another big concern — the baby donkey had diarrhea and the mom had a severe case of pneumonia. 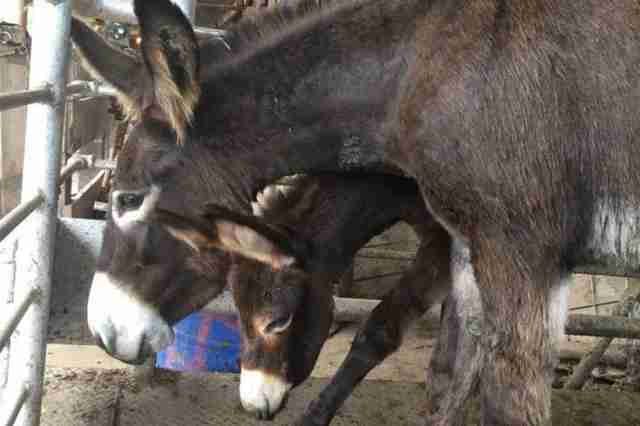 Still, the mother donkey was doing everything she could to protect her baby, keeping him on the far side of her. 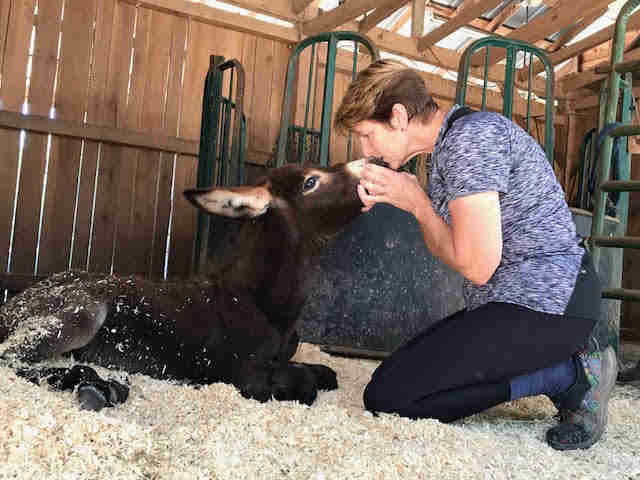 But at this point, Bartfield didn’t care who might be making a profit — she just wanted to rescue the mom and baby, whom she named Blossom and Huckleberry. So she paid $400 for the pair, and organized for them to be transported back to her home immediately. 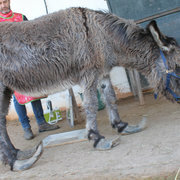 The donkeys were safe now, but the whole ordeal took a toll on Bartfield. 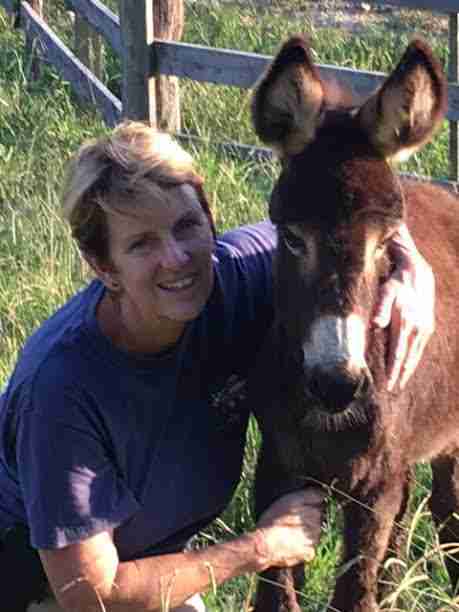 “I had to pull over shortly after leaving with Blossom and Huckleberry to dry my tears so that I could drive on,” Bartfield said. When they arrived at Bartfield’s home, she immediately got Blossom and Huckleberry into a clean, dry stall with fresh food and water. Huckleberry, who was only about 5 weeks old at the time, started to relax. But his mom, Blossom, was still a bit shellshocked. Despite being sick, Blossom did her best to care for her baby. Bartfield tried to help Blossom get better, but she kept getting worse and worse. Sadly, Blossom passed away a week later. Now Bartfield was worried sick about Huckleberry — would he die, too, either out of grief or sickness? And with each passing day, Huckleberry got healthier and stronger. 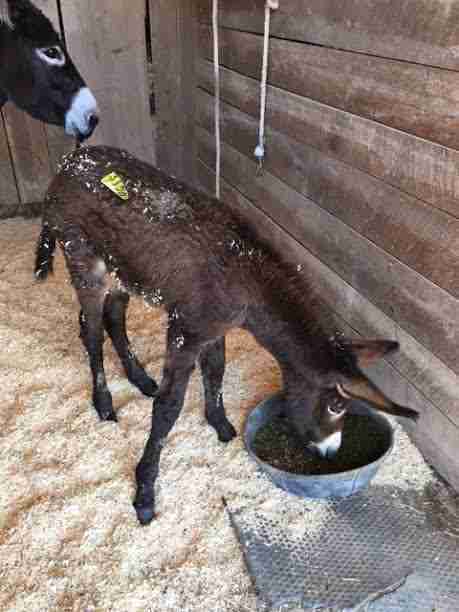 He’s also started hanging out with Marigold, the other donkey Bartfield rescued from the same shipping pen. “I can't say that she really likes him yet, but she does put up with his baby antics,” Bartfield said. Besides following Marigold around, Huckleberry loves to eat, sleep and get into mischief, according to Bartfield. But Bartfield doesn’t mind the occasional nip from Huckleberry. She adores everything about him. 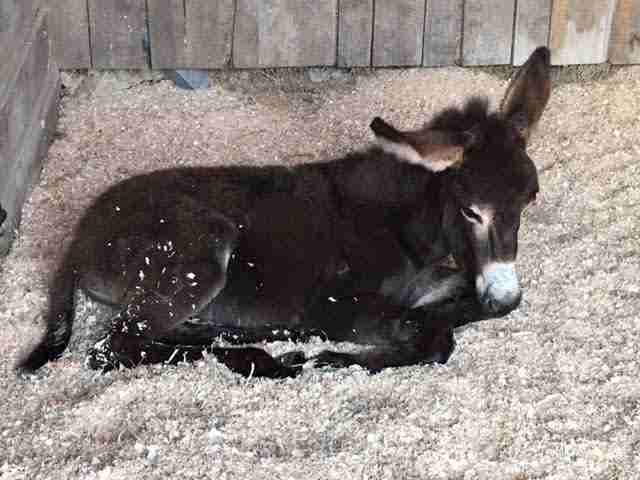 To help Huckleberry keep growing big and strong, you can make a donation. You can also help support SNAP-NC, which helps address pet overpopulation through a low cost spay-neuter program.